Paramore is an American rock band formed in 2004. 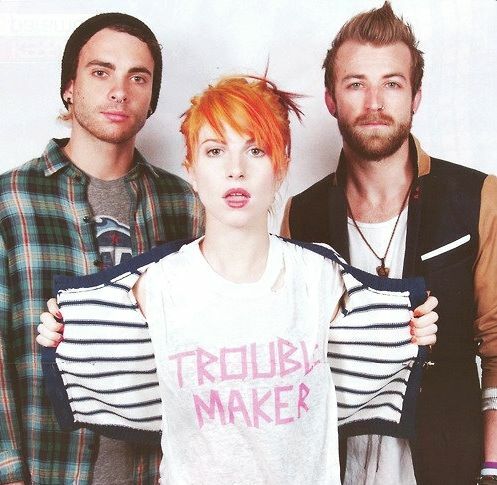 The band consists of lead vocalist Hayley Williams, bassist Jeremy Davis, and guitarist Taylor York. Although their blend of emo-pop and slick, anthemic rock & roll eventually made them stars on both sides of the Atlantic, Paramore began humbly enough in Franklin, TN, where Hayley Williams met brothers Josh and Zac Farro after moving to town from Mississippi. Already a powerhouse vocalist at the age of 13, Williams joined a band that the Farro siblings had formed with local guitarist Taylor York. She left the group soon after, signing with Atlantic Records as a solo artist instead, but clashed with the label over the direction of her music. Seeking to front her own band, Williams convinced Atlantic to let her piece together a full lineup. 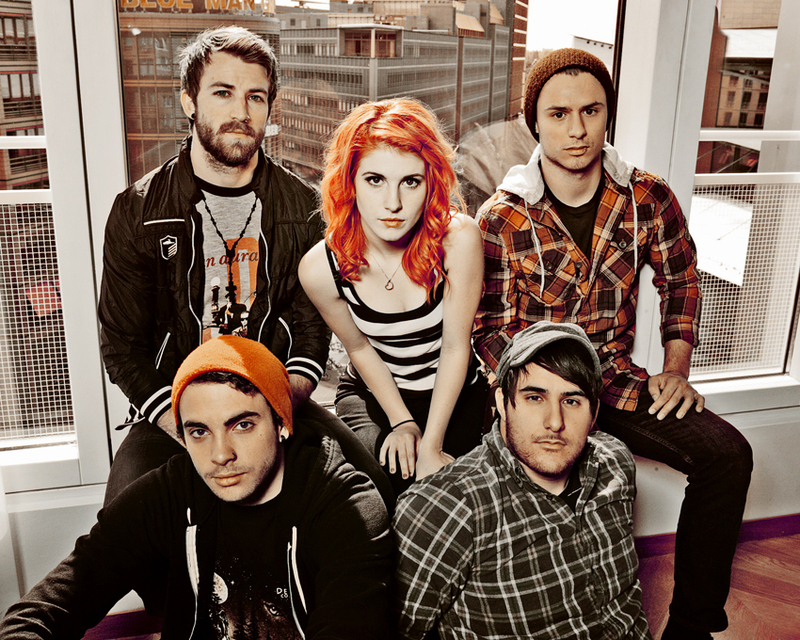 Josh and Zac Farro were recruited for the job, as were guitarist Jason Bynum and bassist Jeremy Davis. The following summer saw the release of the band's sophomore album, Riot!, which was recorded alongside producer David Bendeth. Buoyed by the popular singles "Misery Business," "crushcrushcrush," and "That's What You Get," Riot! turned Paramore into industry heavyweights, going platinum within its first 13 months of release and earning the band a Grammy nomination for Best New Artist. With original guitarist Taylor York now back on board, Paramore toured exhaustively in support of the record, even landing a two-month jaunt across the continental U.S. with their idols, Jimmy Eat World. Meanwhile, the band found time to contribute two songs to the best-selling Twilight soundtrack, including the Top 40 single "Decode." A live album entitled The Final Riot! was released several weeks after the Twilight soundtrack, capturing the group's strength as a live act and concluding the long touring cycle in support of Riot! Paramore publicly struggled with fame throughout 2008. Of particular note was the attention lavished upon Williams, whom many media outlets deemed to be the leader of the group. Rumors of a breakup began to circulate, yet Paramore's lineup remained intact, and the band retreated to a California studio in 2009 to work on a third album. Following a popular summer tour with No Doubt, the group issued Brand New Eyes, a pensive record that featured some of Paramore's strongest songwriting to date. The album debuted at number two with sales of 175,000 copies, besting Mariah Carey's Memoirs of an Imperfect Angel. Brand New Eyes went gold by the end of the year, and "The Only Exception" became the band's highest-charting single to date in America. Meanwhile, Williams scored her own chart-topper with "Airplanes," a multi-platinum collaboration with hip-hop artist B.o.B. Long-simmering tensions between Williams and the Farro brothers had reached a boiling point by late 2010, though, resulting in a messy split between Josh and Zac Farro -- considered by many to be the band's co-founders -- and the three remaining members. 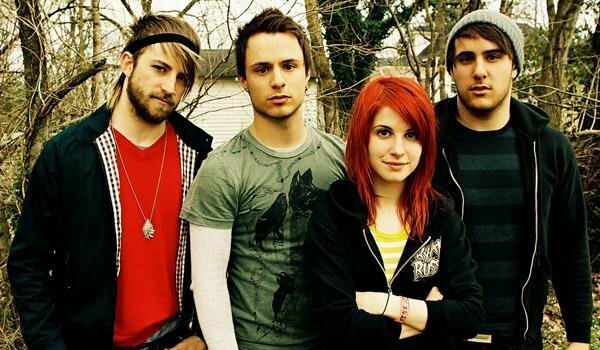 Days after his exit, Josh Farro wrote a blog post detailing the band's history, including previously unknown details regarding Atlantic's early involvement and Williams' solo contract. On January 10, 2011, in an interview with MTV, Hayley Williams said that despite the band losing two of its founding members, they will be releasing new music in 2011, although it is not known yet if they will manage to record a full album for release this year, or just release some songs. The singer also admitted that Paramore's style was likely to change with the new lineup, but clarified that the band would still retain their signature sound. On October 11, 2011, Paramore announced that they will be releasing three new singles over the next three months until the end of 2011, with a single per month. The band has set up the "Singles Club" on their website which gives fans the chance to purchase the new singles when they're released, as they're released exclusively through the Singles Club and will not be sold on iTunes or in stores. A song called "Renegade", premiered the day of the announcement, with "Hello Cold World" to follow on November 7 and "In the Mourning" on December 5. Paramore are currently trying to decide on a producer for their new album, Hayley told the fans to keep a close eye on the Official Paramore Twitter account over the coming weeks as they will make any announcements on there first. June 2012, the Hayley Williams-fronted band announced they're working on their fourth album, yet untitled, a record which will be the follow-up to 2009's 'Brand New Eyes'. Their latest single "Monster" will appear on the album, and you may listen to it below.